What does each person pack? Passport, clothes for each day, dress clothes, Bible, paper, pen/pencil, sleeping bag, pillow, warm jacket, flashlight, toothbrush, toothpaste, toilet paper, wet wipes, hand sanitizer, washcloth, towel, personal medication, personal water bottle, comfortable shoes, beach chair, and maybe musical instruments. Download the packing list pdf here. Ice chests (for all lunches and snacks), Igloos (team drinks & VBS snack time), Tents, Folding table (brushing teeth area), Canopy (EZ-up or other), First aid kit, Tarps. 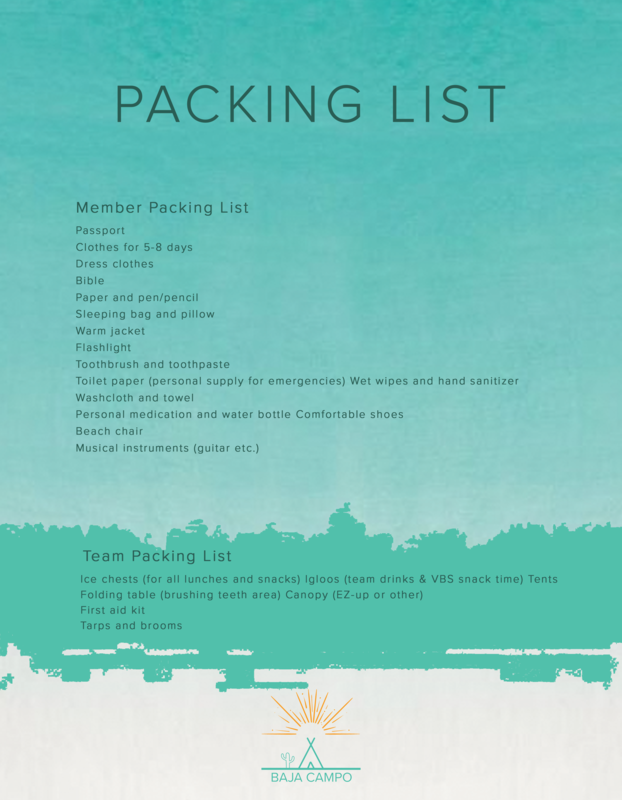 Download the packing list pdf here. How will Baja Campo be different then the APU experience? We will strive to provide an experience that is comparable to the APU experience we will strive to exceed expectations where we can. Above all we want to honor God and the work he will be doing through us and through our groups. Are there gluten free meal options? We care about participants who have special limitations on what they can eat. We will do our best to offer special accommodation to those who let us know ahead of time. Breakfast, lunch, and dinner are included. You’ll need to bring an ice chest and igloo to take your lunch with you while you minister during the day. Can we contact you for answers? Is free customer service included? We pride ourselves in knowing what is going on in the areas where we work and minister throughout the year, and offer our expertise freely to any who contact us. Our staff on site and in the United States includes missionaries, pastors and coordinators. email any questions to jrose@bajabound.org. Can you help me with immigration questions? Our coordinators offer up to date information on Mexican immigration. It is, however, your responsibility to comply with the laws of Mexico and the United States when crossing borders, showing documents and traveling. Does my cell phone & data work in Mexico? How do I access the internet? Contact your carrier first to see what options you have for cell use in Mexico. New cell services have started to include Canada and Mexico in their plans for text, talk and data. Internet data is also available in the local Starbucks in town. We suggest you tether your phone to your laptop for data use if available. Transportation is not included for church or school groups. If you are flying, we suggest you fly into San Diego, California, and rent vans from the airport. You will drive 120 miles east from San Diego to the Calexico, California, border crossing if you are going to Mexicali. You will drive 100 miles south from San Diego if you are going to Ensenada. What’s the typical daily schedule? We strive to provide an exclusive relationship with a church ministry in Ensenada. We know ministry can go deeper if your relationship continues on from trip to trip. Our coordinators on site are your liaison with local ministries and churches. We have worked with hundreds of churches over the years. What’s included with chapel programs in english? We provide chapels in english for your groups before and after you go out to minister each day. Motivational speakers are brought in to point us toward deeper relationships with Jesus, to stay focused on why we do what we do! Worship bands wake up our spirits to motivate us to thank the LORD Jesus for who we are in Him. Special moments happen during the week where many stand to dedicate their lives to Jesus. The greatest miracle is to see a changed life, where we are being set free from the bonds that hold us. Remember that the chapel area is a field or amphitheater, so you will need to bring your own form of seating. Ask us what options are available. What bathroom facilities are available? Campo has sufficient flush toilets for all camp sizes. You are responsible to bring your own tents. Security is provided.